On Tuesday, June 10th, 2008, we set up our phones on the terrace of the Cannon House Office Building in Washington DC. With the U.S. Capitol as a backdrop, Members of Congress and other citizens used these phones to talk directly to volunteers in Iran. US Representatives Barbara Lee, Lynn Woolsey, Marcy Kaptur, Sheila Jackson-Lee and former Representative Bob Barr all took turns talking with our volunteers in Iran, and Representative Ron Paul spoke at the event about the importance of working for negotiations with Iran. This event was part of the Campaign for a New American Policy on Iran, a coalition of organizations calling for direct, bilateral and comprehensive talks without preconditions between the governments of the United States and Iran. The members of Congress joined Campaign members, foreign policy experts and American citizens in using a row of 60’s-era red “hotline” telephones to talk directly to volunteers in Iran. We would like to thank everyone who volunteered for this event. In the US, this including Marie Rietmann, Jim Fine, Kate Gould, Ed Martin, Stephen McInerney and Arash Nourouzi; and our fantastic translators, Farhad, Shahin, Hadi, Ebrahim and Roya. We had our largest group of volunteers in Iran so far! We want to thank Morteza, Maryam, Nima, Maysam, Osama, Mehdi, Mina, Hadi, and Mohsen for joining us on the phone - we're proud to be working with you all to build this bridge between our two countries. Special thanks to Carah Ong of the Center for Arms Control and Non-proliferation who organized the event. We're looking forward to continuing our work with her and the Campaign. "Instead of talking about war, the U.S. government should talk to Iran. At the same time, Congress must reassert its constitutional authority and not give the president another blank check to wage another costly war,” says Bob Barr, former Republican Congressman from Georgia and the Libertarian Party’s 2009 Presidential nominee. “It is long past time to recognize that the administration's policy toward Iran is counterproductive in that it provides incentives for continuation of its uranium enrichment program and assistance to militia factions in Iraq,” says Lt. General Robert Gard (Ret. ), Senior Military Fellow at the Center for Arms Control and Nonproliferation. "An attack by the United States on Iran would be a catastrophe for both countries and would have a devastating effect on the entire Middle East region. Bombing nuclear sites would only delay, not eliminate, Iran's nuclear program and would virtually guarantee accelerated efforts to build a weapon for self-defense. Iran would certainly retaliate, closing the Straits of Hormuz and leading to a surge in oil prices. It would unleash a wave of attacks against US forces in neighboring Iraq and would exploit its relationship with Hezbollah to stage terrorist attacks against Israel and also possibly within the United States. It could destabilize neighboring Afghanistan. US response to Iranian resistance would likely result in huge civilian casualty levels,” says Phil Giraldi, a former CIA Counter-terrorism specialist who currently is a contributing editor for The American Conservative magazine and a columnist for Antiwar.com. He continues, “In spite of the bellicose rhetoric coming mostly from Washington, the American people do not want another war, nor has the White House yet made a case that Iran poses a genuine threat against the United States. The Bush Administration has refused to negotiate outstanding issues unless Iran, as a precondition, surrenders on many key points, a tactic designed to guarantee that no talks will take place. The danger that a new war in the Middle East will begin either by accident or by design is growing. It is time to begin serious negotiations, before it is too late." “The spiraling crisis between Iran and the United States can only be eased through dialogue. Angry demands and threats of military attack dangerously increase tension in a volatile region. The path of direct negotiations without pre-conditions between the US and Iran is so low-cost that it seems folly not to try,” says Stephen Kinzer, award-winning foreign correspondent and author of All the Shah's Men: An American Coup and the Roots of Middle East Terror. 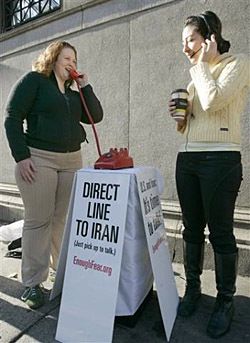 On Tuesday, November 13, 2007, the Enough Fear campaign set up the first US/Iran direct phone link to allow Americans and Iranians to speak directly to each other. This was our first trial run of the phone system, and we're taking lessons from it to improve and expand this event. Read press coverage of this event and get more information on our red phone campaign. We're looking for volunteers in the US and Iran so that we can bring this event to more cities. The most urgent need we have is for volunteers in Iran who are willing to get on the phone for an hour or two and have discussions with Americans. You can join us by cell phone or Skype, and you can take part as an individual, or with a small group of your friends and family. We also need people in the US who want to help organize and staff the events, do publicity, and act as translators. If you'd like to volunteer, please email us at contact@enoughfear.org. Air America's Rachel Maddow discusses Enough Fear with co-founder Nick Jehlen. 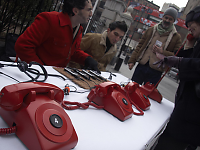 On Saturday, January 19th, 2008, we set up four phones in City Hall Park in New York that were connected to volunteers in Iran. For two hours, we invited anyone passing by to pick up one of the phones for a short conversation. You can view press coverage and photos of this event and get more information on our red phone campaign. Special thanks to all our volunteers who braved the cold to help us pull off this event. We want to thank The Lee + Gund Foundation for their financial support. And thank you to everyone who made donations to make this event possible.